Our theme this year was Lean-By-Doing: Accelerating Continuous Improvement - emphasizes the tacit nature of implementing Lean, the importance of tying together the technical and social sides of Lean, the significance of management's involvement and the ability of organizations to sustain the gains. A full 50% of sessions were interactive, participatory or hands-on! GBMP members & groups of 10+ save BIG every year with our membership rate & group discounts. Be sure to subscribe to our mailing list to get all the latest conference news as soon as it breaks. Contrary to popular belief, practice does not make perfect, it makes permanent, and the long-term practice of a traditional business model has deeply embedded traditional beliefs and systems that obscure Lean thinking. Even after decades of failed attempts at Lean transformation many organizations fail to realize that concepts like one-piece part and information flow or zero defects simply 'do not compute' when read from a test or presented in a classroom. Academic Lean learning alone typically creates a "that wouldn't work here" response, and soon degrades to no learning unless there is experiential validation: theory proven through practice. 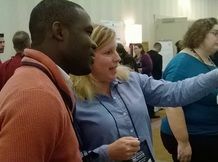 Our 12th Annual Northeast Lean Conference addressed this obstacle head-on with two days of Lean By Doing. For 2016, we committed more than half of the conference sessions to be hands-on or interactive activities with take-aways and real-world examples presented by Lean executives, managers and front-line employees. Ideas, tips and tricks you can take back to foster your organization's Lean journey. 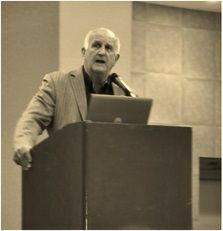 In the words of noted author and change-agent, Jerry Sternin, "It's easier to act your way into a new way of thinking, than think your way into a new way of acting." More than 200 organizations and 600 people joined us on October 4-5, 2016 at the DCU Center in Worcester MA to learn how to help their organization act its way into Lean thinking. 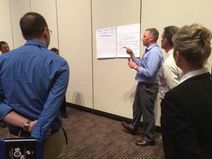 The 2016 Northeast Lean Conference featured five tracks and includes presentations by Lean thought leaders, peer-to-peer discussions of critical best practices, experiential learning through hands-on exercises, exceptional bench-marking opportunities and more, all designed to help you take your Lean initiative to the next level. Our practical learning format catered to all learning styles & levels of experience. From the front lines to the corner offices, there is something for everyone, including unmatched access to Lean thought leaders, meeting real people sharing real stories and fresh perspectives, and networking with peers who are also on the Lean journey.